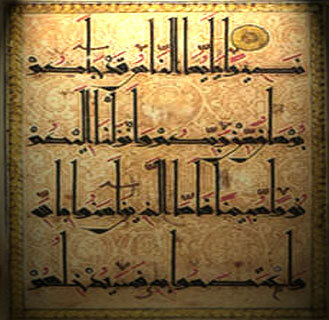 The Quran claims to be a miracle in the Arabic language and thus inimitable by any man. This means that it claims nothing the like of it can be written; down to even one chapter (which can be as long as 10 words). What this means is that we must address whether the man who brought this message- Muhammad (saw) was either a power-seeking liar, simply insane or indeed a Prophet of God. His message was not only a rational one but was radically different from the society he lived and was brought up in. The works of many a ‘genius’ are usually the product of the society they lived in, but the message of Islam was so out of sync with Muhammad’s (saw) time that it begs further analysis into its origins. And if Muhammed (saw) was a genius and desired to get power then he could do very different to bringing a radically different way of life to the Arabs and challenge them to imitate the speech of the Quran, when he lived amongst a nation of poets and orators, who prided themselves in their extensive expressive, poetic and creative abilities. If he (saw) were seeking power, this approach would make him extremely vulnerable to his (saw) enemies. Challenging them in theirown area of expertise would in effect pre-empt complete political suicide. Why would he give his enemies an easy chance to destroy his entire message if he were a shrewd man of political desire? What may be expected to follow are literary ‘out-doings’ of the Qur’an; rendering it beatable and easily dismissed. Such accusations never surfaced, instead hostile tribes resorted to accusing Muhammed (saw) of being a ‘magician with words’, an indictment which goes some way in signalling the seriousness of the Quran’s challenge and the intellectual defeat of Muhammad’s (saw) enemies. If the Quran could have been imitated then Muhammed (saw) must have been insane to challenge people, indeed why would he have thought his Quran could stand up to scrutiny from a nation of poets and prose writers (of a language arguably second to none in expression and richness)? What we do know; is that the Quran was used by Muhammed (saw) to refute and counter the backward way of life the pagan Arabs were living. The Quran required its teachings to make rational sense and provide a viable and coherent alternative way of life for the pagan Arabs to follow- such a message would be nigh impossible for a mad man. In all the ways such things can be judged, Muhammed (saw)’s mission was highly successful, but he was only able to obtain his authority because of the Quran. Without it, his ‘followers’ would have been negligible and his ‘proofs’ non-existent. Rather than just being drawn in by a magnetic charisma, most of his followers converted to Islam based upon reading/hearing the Quran and not because they just liked Muhammed (saw). Now, most will not be able to speak Arabic and so merely telling you that the Quran is a miracle of the Arabic language is meaningless to you. So, what we need to point to is the existence of the phenomenon and the circumstances around it. And I will leave it to you to rationalise out the alternative possibilities that could have given rise to such a phenomenon, bearing in mind that the Quran is not a parlour trick done with smoke and mirrors, neither is it restricted to only a few ‘trusted inner circle’ clerics to read (so as to possibly hide the ‘secret’ of it’s purely human origin), but rather it was made available to all to see and access, and it serves as the lynchpin and justifying basis for the whole Islamic ideology, Civilisation and State. Bearing all this in mind, it brings our minds to ask, could the Quran really be the work of a human being who desires power, or is insane? Or is it from no one else except the one it claims to be from- the one who sent Muhammed (saw): the Originator of the Universe itself.